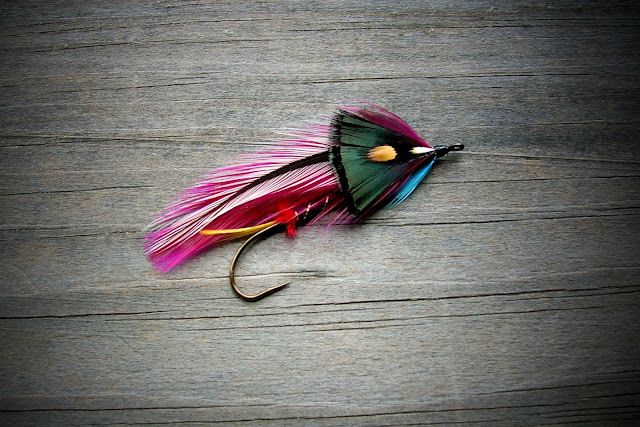 The Muddler Minnow, a streamer fly created by Don Gapen back in the thirties and pretty much a staple in most anglers fly boxes. 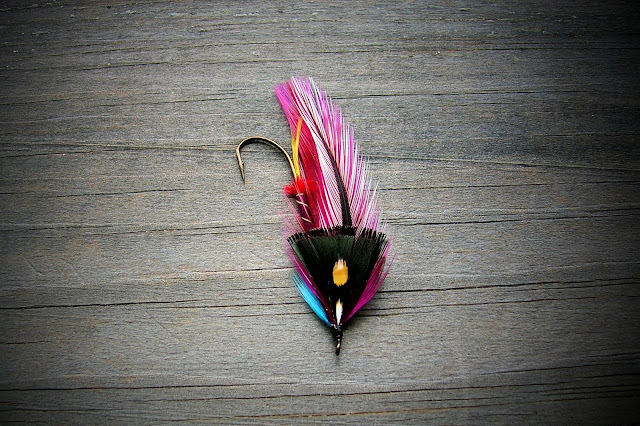 This fly is used by myself a few times a year, those times when I fish larger waters where bigger trout will take the fly. On the small streams this streamer always seemed to be out of place. Last fall I was informed by another angler, "Kirk" that a Muddler was very effective in a small stream. The wild brookies went crazy for it. Well it was a few days ago when I visited a special stream and I had in my mind to fish a Muddler. I have several and in sizes 6 to 12. I don't tie them, because I never got the hang of working with deer hair. I tied on a size 12 and I realized one of the better days of angling for wild trout. The brookies for some reason found the fly to much to resist. They hit it in every way it was presented. The saying that you learn something new every day. That applies here on the small streams of Connecticut. This particular day was a crisp one for this time of year. Overnight temps were in the low forties. The stream was clear and water temps at an even fifty. Who knows what lurks in these plunge pools and behind those boulders....The Muddler does. A brook trout and the Muddler that fooled him. These fish were absolutely beautiful. They seemed to have retained their color and spotting. Maybe it's the cold clean water they live in. True beauty in a tiny form. You don't have to catch a fish to enjoy your outing. Just look around. There's not much I can say about this photo. The laurel and moss covered stones of this stream will protect fontinalis naturally. We have to do our part also. Sunday in the New England area we received a substantial rainfall. Most places received two and a half to three plus inches of rain. With the rise in water levels the trout were able to move freely up and down stream. The heavy rains also washed in a considerable amount of food, plus moved plenty of in stream food. This combination brought about a selective feeding pattern. 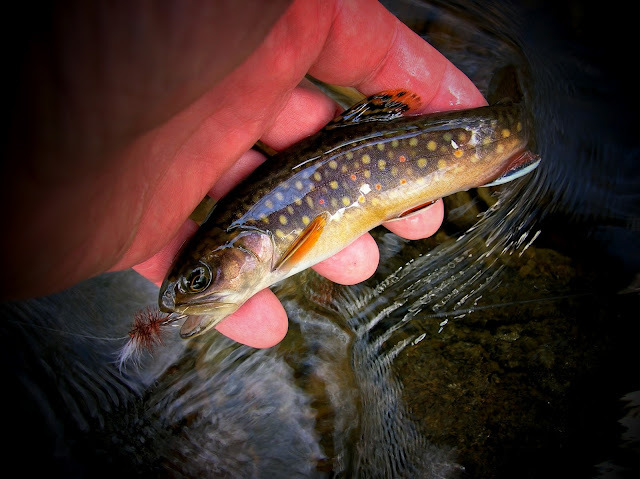 I was able to bring a few brookies to hand by using a variety of flies from dries to wets and I had few chase a streamer. This was a welcomed rain. The Bomber worked at times. Every time out I see more Spring time beauty. Brook Trout Forest is starting to shape up. This little jewel took a Picket Pin. Now if Mother Nature can provide an inch or so of rain each week, it will be appreciated by all. My first cup of "Joe" black hot "Nantucket" thanks to Green Mountain Coffee. A fine Vermont coffee roaster who's coffee is about the best. My 2 pennies anyway. Well back to what this post is about. Sangwiches" or to those with proper English, "Sandwiches". They are one my favorite food items. They are pretty much easy to prepare and can be quite satisfying. I have a few of my favorites and they have been modified some to go with I'm supposed to be eating now. Although this is not a sandwich, raisin bread toasted, it's a healthy version to the bacon, egg, cheese sandwich of old. This "Sangwich" is a mortadella, roasted Cubanelle pepper, one slice of provolone, on Italian bread. This is a much smaller version than I used to eat. A baked ham "Sandwich". This one features baked ham, sliced cucumbers, and a slice of red onion on a sesame roll. I would be happy to use a whole wheat bread if I could find one with a good crust and some texture. This "Sangwich" a remodeled version of an Italian classic. It's Italian sausage, with meat sauce, Italian sharp cheese, on crusty Italian bread. Again it's a smaller portion. Well I think I got it right. So I think I'll have a second cup of Nantucket. Opening Day, And "Earth Day"
Yesterday was the opening day of the inland fishing season. And although Connecticut has a year round trout fishery in their Trout Management Areas the general season is still the third Saturday in April. I met up with Kirk at a small wild trout stream at about 7 AM. The weather was cloudy and a bit muggy, good for fishing. As we arrived stream side the water was awesome, and although it was a bit low the flow was very good and the water temps read 56 degrees. We started fishing and it wasn't to long before we had a wild brookie at hand. These fish were very scrappy and beautifully colored. They were not to fussy as to what was on the menu and an assortment of flies worked. As the sun broke out the air temps shot up as well as shining brightly on the stream. At that time the fish took to cover as well as changing preference to wet submerged flies. As the afternoon came we worked our way back to our vehicles, stopping every so often to remove some nasty debris. It was a great start to the new season. Kirk stalking some wild brookies. His comment was they appear from no where to hit your fly, and if they miss they vanish. The most beautiful fish that swims. 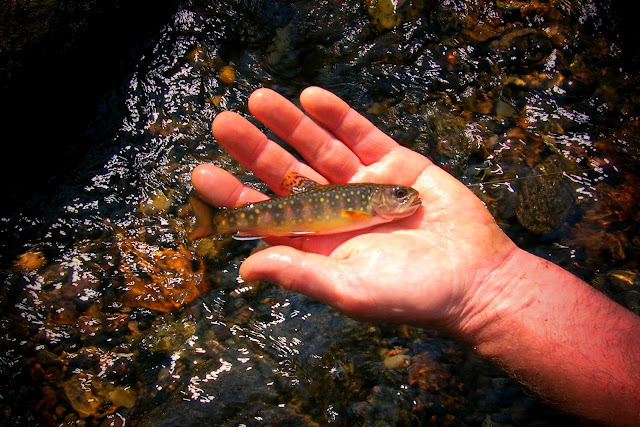 When the color scheme was created for the brook trout they went all out. We consider it a privilege to hold these wild jewels. Today is Earth Day, and early this morning Jeanette and I took our morning walk. As we walked through a park close by we were greeted by a family of geese. The goslings ever so small an full of downy feathers were a nice sight. And with some much needed rain in the forecast it should be a great day. Spring is a season that runs a very close second to my favorite season Autumn. Yesterday we took a walk along a beautiful wild trout stream. A quiet cool day with plenty of sunshine. We were looking for some of the true signs of Spring the ones that appear and tell you it's here. Well we found some of them and they did what they always have refreshed the mind and soul. One of the wonderful sights of Spring, Trillium in bloom. A special sight, brook trout lying at the back of a pool waiting for an insect hatch. They waited for a few moments to allow me to take a photo and scattered to a safe hiding place. I know it's into the fishing season for many of us and much of our time is being spent on the waters we love. But there are those times, like lunch break, or time out from our demanding work schedules to take a few minutes to refresh our minds and put things back into focus. "Joe and Me" by James Prosek tells of a relationship by an older game warden and a youngster. It's a friendship that grows by showing each ones love of the outdoors. "Tight Lines" is a journal of The Yale Anglers. Its many entries tell of some wonderful happenings of a group of scholar anglers. There is one entry that I found to be outstanding. "The Lost Striper". If you have the chance to read the books I'm sure you will find them worth reading. A Weekend With "Kiwi's Fly"
I had gone fishing on Saturday visiting a small stream. The fishing was fairly good, with the exception of bleeding of the legs caused by briars, which seem to be very sharp and strong considering the lack of rainfall. Well yesterday Jeanette suggested taking a walk through the woods. Her incentive was the beautiful day and wanting to take some photos. So seizing the opportunity to be fishing again there was no hesitation. As we walked the stream, Jeanette taking photos and me fishing we spent several hours of total enjoyment. Several months ago I did a fly swap with Chris, aka Kiwi at The North River. I received some wonderful Tenkara flies and one in particular the Royal Sakasa Kebari, I hope I spelled it right. So I just call it "Kiwi's Fly". 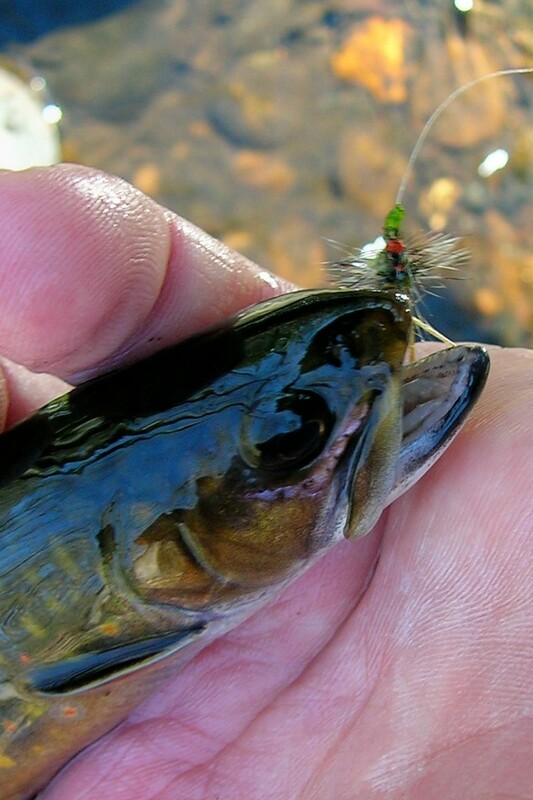 The fly produced some wonderful fish, at one point this one long riffle gave up many small brookies in the 3 to 4 inch range. This was a good sign of a healthy stream. 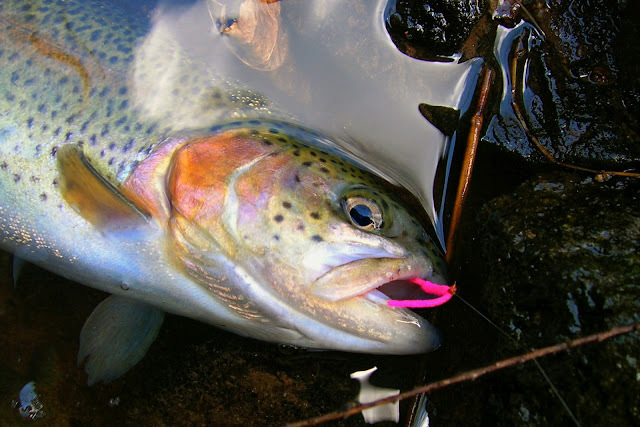 This a rainbow who found it hard not to slam "Kiwi's Fly"
We stopped for lunch at stream side. And in keeping with healthy eating enjoyed a chicken cutlet, (they were baked not fried) sandwich and a cucumber salad. 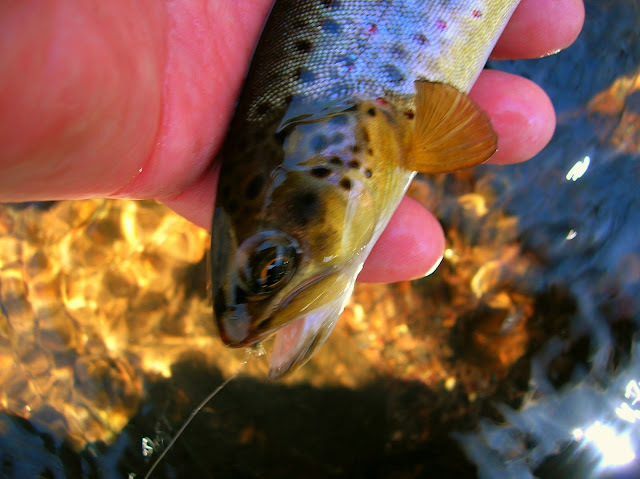 As I fished down stream I managed to take a few nice browns. The "Kiwi Fly" worked well on this wild guy. He just stopped to see what was happening. If your interested in some of Chris's wonderful flies stop by and see him at "The North River"
In New England we have been suffering from a lack of substantial rain fall. In Connecticut we are about four inches below normal. The streams are still flowing but a loss of volume is starting to show. While air temps have been cool especially nights this has managed to keep the waters cool. While walking the woods I've managed to see beautiful signs of Spring. They show themselves in the form of wild flowers popping up through the brown leaves of last Autumn. I fished this stream the other day and was given the chance to take a few brookies. They were holding in the riffles and took a Bomber with gusto. There were two larger pools on either side of the riffle that looked like prime places for a nice brown. I sent the Bomber through the pool several times, and there was no respect paid this work horse. A fly change was needed for the pool just looked to promising to give up on. Perhaps a PT nymph or a wet fly might do the trick. So out of the box came the "Pink Chenille" nymph. Sending the nymph on several drifts through the pool brought nothing. Then on one drift nearer the bank a fish swirled and the fly was taken. The little 6ft 2wt was put to the test with this fish. It was a rainbow of generous proportions. The trout covered every inch of that pool trying to take me into the undercut roots and leaping on several occasions. He finally gave up and was photographed and released. And as part of my healthy lifestyle change. Chicken hash. Chicken breast diced, red pepper, fresh baby spinach, scallions, diced Italian sharp cheese and salt, crushed red pepper, and chile powder. It's fried in a bit of olive oil to a golden brown. It can be served with a baked potato, and beverage of choice. These two wonderful saddles are the main part of a streamer I've created. It takes its name from a small stream in Connecticut. And although I may never fish this fly in its waters the beauty of all that surrounds these waters was the inspiration for this streamer. 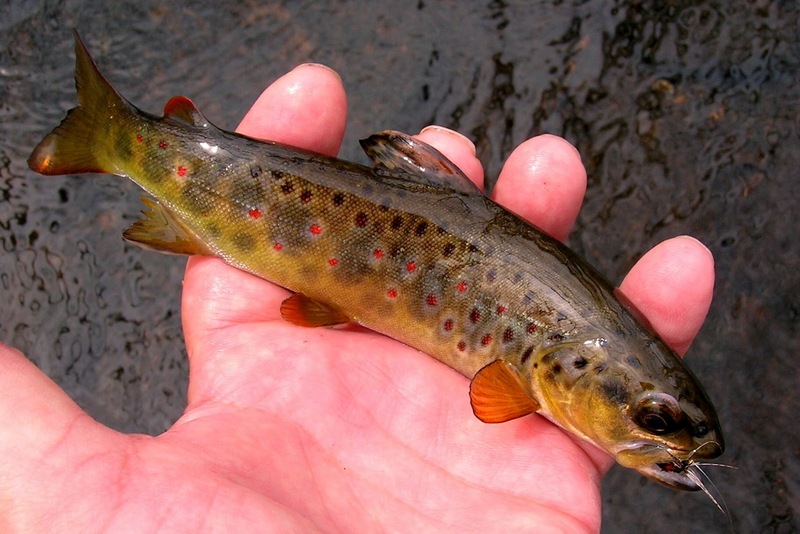 In another post I'll show you the stream and some of the wild trout that call it home. In the meantime I hope these Silver Badger and Magenta saddles lashed onto some iron will try to show the beauty of the stream. The feathers seem to blend as the stream does as it cascades along its journey. The "Adams" dry fly is another one of those classics that should be in every ones fly box. This pattern has been around for almost a century now and still produces fish when called to duty. The fly was designed by Len Halladay of Michigan at the request of his close friend Charles Adams. In this day of matching the hatch, this is one fly that comes close in most cases. I carry this pattern in three sizes, 12, 14, and 16. Since 1922 the "Adams" has been the fly to go to. It has earned the title of "Classic"
"Fork Tails" And Other Foodstuffs. 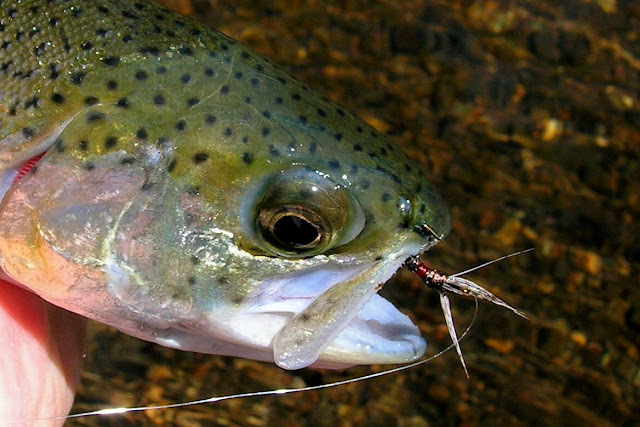 Trying to figure out what trout eat , when they want to eat, and at what stage of the life cycle they will eat it has always been a part of fly angling that least appealed to me. I always feel that to guess the right one would need a degree in "insects of the stream". Then I would need a fly box or should I say a fly box for every stage of an insects life. 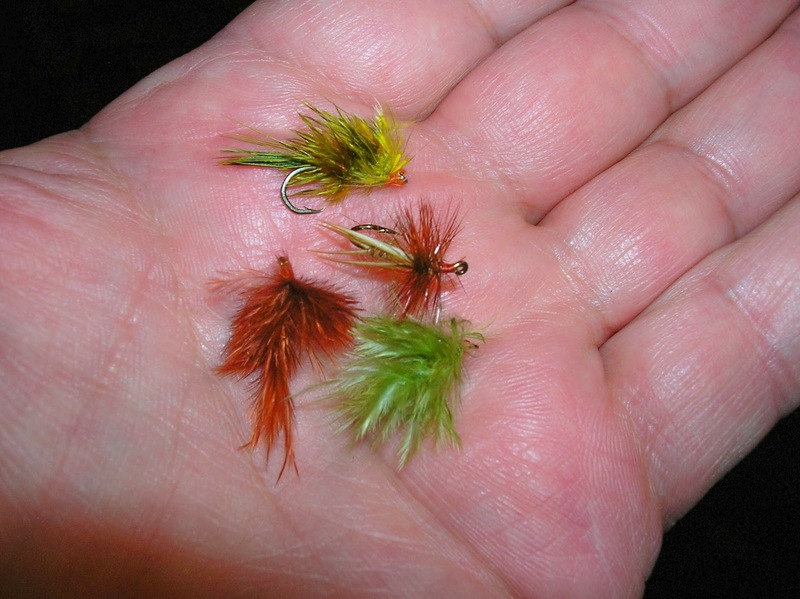 I decided long ago to carry a few flies, the ones I have confidence in, flies that have proven themselves to work, are highly visible to the fish and especially to me, and most important are easy to tie. With that I can head to a small stream armed with one fly box and have a great day. "Simplicity". On my last outing I chose a few of the flies that I thought would work well. One pattern was a "Smoky Mountain Fork Tail". It's a pattern created for wild trout in the in the southern states, but it work very well here also. The other is a pattern I created, "Raggedy Ann". I'm going to tie one using the colors red and yellow and call it "Raggedy Mickey"
"Raggedy Ann", they like it. A "Fork Tail" very effective.